1. I found my 1st gray hair ever. I am so sad. I'm trying to look on the bright side. Isabel has like one hair follicle with no pigment or something because she has always had one white hair since she was little. A hairstylist told me not to pull it because it means Izzy is smart. So, I now I am inclined to think that I am getting smart since I am just now growing gray hairs. Ya think? My dad must be a freakin' GENIUS! 2. At 9pm I turned off our porch lite and put what was left of our candy in a bucket on the porch for any stragglers that came by and didn't realize the no porch lite = no candy. An hour later I heard something so I went outside. wish. You might as well come out to investigate a strange noise or something." The whole bucket was gone! A few sporadic pieces of candy were on the sidewalk like someone grabbed the bucket and ran. HELLO! It's FREE candy- I don't care who takes it. But WHY steal my bucket? Granted it was just a big ice cream bucket, but I USE those buckets for stuff (like bath toys and rice and ...) and now you took it. And I'm betting it was some kid too old to be Trick or Treating anyway. I am getting so spoiled!! I think I will post about how I wish I could win the lottery, but never buy a ticket because I know it's wrong. Will bloggers unite to give me millions??? ;) Thanks again. ***** Halloween pics to come!!! Oh, and Seiuli Saturday is back. Check out my hot hubby!! "Bill and Ted's Excellent Adventure" Physco only quotes that movie like once an hour for me to know that so I'll dedicate it to her. I found my first gray hair at 15. Don't be too bummed. I will have to dye my hair for the next 11 years so Rosalind can still have a "young mom." Otherwise I'd be about a third gray. Feel bad about THAT. I actually knew this movie quote!! Can't wait to see the halloween pictures! ps. I love your profile picture! That Klin is so nice ; ) What a great friend. Klin can neither confirm nor deny the sending of such a hawt looking shirt for a friend whom she admires and loves bunches and bunches. She can openly admit to wanting so see you in this having fun. She can admit to knowing about some help but cannot disclose whether that help came from inside or outside of your home ;) or both. I love the new pic!!! You can pull off so many looks and make 'em all look good. "As you can see, Genghis very much enjoys Twinkies because of the excellent sugar rush". As for gray hairs, I've never personally found a gray hair on myself, the husband has seen one, but if I can't see it it doesn't count, right? A gray hair? NO! Says it isn't so. That means there's only me left ;) HA! 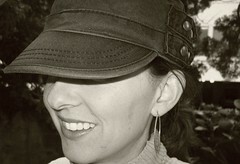 Hey, I love your profile pic, you are a-rockin' that bandana. "Be excellent to each other...Party on Dudes!" I'm sorry your candy dish was stolen-- that stinks. My first trick-or-treater didn't bother saying "trick-or-treat" or "thank you" as he left my porch. He said instead, "What!? We only get 1 piece of candy this year?" Ungrateful kiddo-- I gave you TWO pieces of candy! And what do you expect? I have 300 trick-or-treaters coming and we're in a RECESSION! Geez. 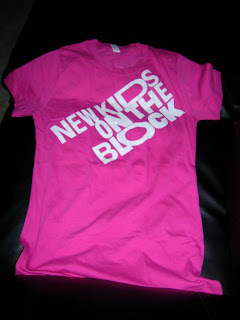 I love your new shirt-- NKOTB ROCK! As far as gray hairs go, my friend, you are talking to a woman who was completely gray by the age of 30. I wish I could comfort you but you would have to send me some chocolate as compensation first. Gray hair ROCKS too! If I say that enough it'll sink in, right? Thank you for your sweetness on my blog today. My heart is so heavy for Mariah right now, it means so much to me to have some prayers for her. Hugs to you for your kindness. My favorite trick or treaters were two dads totally dressed up, trick or treating with their maybe 18 month old babies. The babies were cute, but did they really need a bucket of candy? These two grown men (soldiers, I'm sure, since they had that tell-tale hair cut and we live on an Army post) were totally dressed up. Not in off the rack at Walmart costumes, but a mixture of homemade and nice store bought. Gladiator and Scarecrow. It totally cracked me up. Sorry about your candy bucket. um, that shirt is pretty awesome, tori! super cool to get some goodmail! I am seriously dying laughing that someone would steal the candy bucket. Foolish. I can just imagine them running for it. 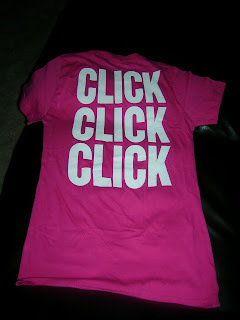 The shirt is so awesome! I think it's great when parents dress up in costume to accompany their kids trick-or-treating...but I HATE it when the parents expect candy for themselves! Bill & Ted's Excellent Adventure. Whoa. Don't forget to wind your watch Ted! He also enjoys Bon Jovi's Slippery When Wet.